Dec. 7th, Forewarned, Not Forearmed? I’ve been interested in the World War II Japanese Internment travesty since I learned of it as a near tot. Living in Chapel Hill I’ve had the chance to know some interesting folks, Eric Muller for one. Eric, self-publisher and UNC Law professor is an internment expert. He often posts his research on that, the Holocaust and other WWII related issues over on isThatLegal.org. Fascinating, if at times disturbing, reading. 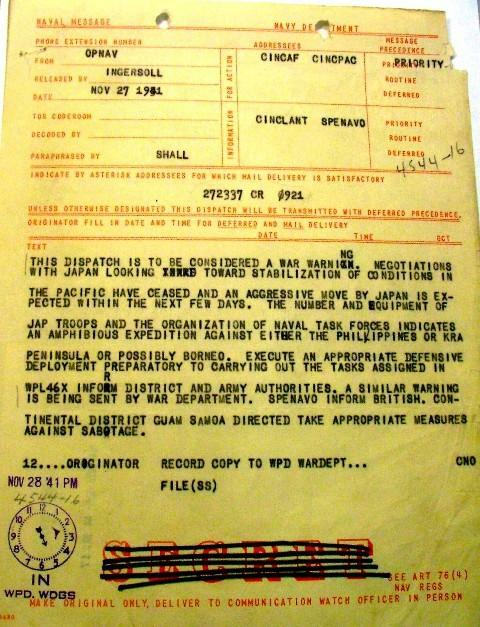 Today he’s talking Dec. 7th, 1941 and the trail of bread crumbs leading up to the foreseen attack on Pearl Harbor and the collateral damage it caused the Japanese-American community. Ouch! Obviously stung by Council member Jim Wards comment about “switch-n-baiting”, RAM Development’s VP Casey Cummings delivered a death blow to Council’s request for affordable condo fees for the affordable housing units and a commitment to energy efficiency. Both requests seem quite reasonable. What use is it for the Land Trust to “sell” a condo to an affordable housing applicant just to have them priced out by condo and parking fees? Not a single citizen speaking at last night’s hearing or at the first public hearing on Lot 5 challenged the Council to ensure energy efficiency. There seemed to be an assumption that “LEED certified” means the development will be energy efficient. However, LEED certified is the lowest level of LEED and even at Platinum status there is no assurance that a LEED building will be energy efficient. To get around that problem, the state of North Carolina has adopted ASHRAE 90.1 for all state constructed buildings. Chapel Hill is not willing to meet the same requirements as NC State? Dang, we usually lead the State in environmental initiative. As far as “bait-n-switch”, RAM was challenged last year on their original rosy financial projections. Were they knowingly over promising expecting to under deliver to get the deal? In the most stark example, Grubb’s financing model would produce a 21.77 percent return on its $10.5 million investment in condominiums on the Wallace Deck site. Ram sees only a 2.98 percent return on its $23 million investment there. Two council members asked Cummings whether Ram’s financial model was too good to be true. He said no projection ever is exactly right but that his company hopes to ride the growing trend of people returning to downtown. After the meeting, Ivy Greaner, Ram’s managing partner, said the profit margins are healthy enough to sustain the project. But Ram also is seeking a foothold in North Carolina. The company is willing to make less money in Chapel Hill to get a centerpiece project in the Triangle. Town investment up 15-fold. Value of the property discounted. Property moving from public to private hands. I understand Jim Wards sentiments. Earlier this year, I asked the Carolina North Leadership Advisory committee to do an environmental assay of the highest caliber. It will be interesting to see this phase of Biohabitats’ research. Many of you have expressed interest in Carolina North. I am writing to invite you to a review of the draft ecological assessment recently completed as part of the discovery phase of our planning process. Chancellor Moeser has said that Carolina North will be a model of sustainability. As one of the first steps to that goal, Biohabitats, Inc. has produced an ecological assessment to inform our planning. We are eager to get your input to help us shape effective plans for sustainable development at Carolina North. To accommodate different schedules, we will hold two sessions. The information reviewed at both will be the same so attend whichever is most convenient for you. 3:00 – 5:00 PM. Parking available in either the Hwy 54 Visitor Lot or n the Rams Head deck. 6:00 – 8:00 PM. Parking available in the School of Government parking deck. Information on transit service to the School of Government is below. If you are a neighborhood or community contact, please forward this to your group as well as any others who may be interested. We hope for extensive participation from the community. My apologies in advance to those who may receive duplicate emails. For Carolina North information, visit our web site at http://carolinanorth.unc.edu <http://carolinanorth.unc.edu/> . To learn more about our current planning efforts and our consulting team, click on Technical Workshops. As always, please feel free to contact me if you would like more information. We know there is great community interest in Carolina North and look forward to working with you at this early stage. The School of Government is served by numerous bus routes, including the FCX, HU, V. S and the RU. The U and G are available for the early session only. Please check the Chapel Hill Transit site at www.townofchapelhill.org <http://www.townofchapelhill.org/> for details. We lost that argument when we passed parking lot#5 as designed. Councilmember Jim Ward tried to put the brakes on Council’s pellmell acceptance of “the new deal”. Failing that, he went ahead and proffered a friendly amendment to not only require LEED Silver certification but to meet NC State’s governmental building standards with the ASHRAE 90.1 %20 energy efficiency requirement. Councilmembers Strom and Kleinschmidt, working against character and on behalf of “the deal”, watered down Jim’s request leaving RAM Development’s VP Cummings to deliver the final smack-down. In spite of those environmental, financial and social concerns, Council went ahead and approved the next, and probably final, stage of the project. Not more than an hour later, during a discussion of UNC’s requested modifications to their development plan #3, Chapel Hill Councilmember Jim Ward aptly describe the fallout from setting that precedent. Now is not the time, it was about three agenda items ago was the time. You just..and others…just said fine with parking lot #5, which is going to have no energy savings. I think we lose our credibility when we pass that and say, “you guys have to do better than us” but our project is fine – it’s so SOP [standard operating procedure]. Thanks Jim, I know it was tough getting crushed by the Lot 5 Jagannath. There’s been a small discussion over on SqueezeThePulp about the declining efficacy of local media outlets in covering our community. I suggested that new media outlets will soon move into this long fallow territory – intensively covering local events – to the possible detriment of traditional news outlets. It appears that Carrboro is the center (once again) of local innovation. As we launch the Carrboro Commons today, we too feel the need for an introduction — sort of a 5W’s on us: the who, what, why, where, when and how. That’s why we believe that Carrboro is an under-served media population. From everything Carrboro folk are telling us, this is a town that needs, wants and deserves a quality news, feature and A&E source. More via the inimitable Paul Jones. …analysis of fresh, whole broilers bought nationwide revealed that 83 percent harbored campylobacter or salmonella, the leading bacterial causes of foodborne disease. That’s a stunning increase from 2003, when we reported finding that 49 percent tested positive for one or both pathogens. Leading chicken producers have stabilized the incidence of salmonella, but spiral-shaped campylobacter has wriggled onto more chickens than ever. And although the U.S. Department of Agriculture tests chickens for salmonella against a federal standard, it has not set a standard for campylobacter. Our results show there should be. More than ever, it’s up to consumers to make sure they protect themselves by cooking chicken to at least 165° F and guarding against ­cross-contamination. Chicken is my dominant source of protein (had a great Elmo’s chicken hoagie, in fact, this evening). I like BBQ, hamburgers, steak but really can’t replace my chicken intake with comparable amounts of beef. And then there’s Mad Cow (which I’m sure a few folks are already convinced I have…). At home I’m not worried. We buy local, and, in any case, Ellie will nail those bugs. What about my regular restaurant rotation? Fear Mediterranean Deli’s chicken souvlaki or Bad-a-Wings great boneless chicken wings? I went to this evening’s Council meeting fully expecting to be steamrolled. Yes, the negotiation team has worked years on “a deal” but not “the deal”. Since Nov. 20th, no real new details have been forthcoming. Mark K.’s remarks that paying reduced fees will make folks feel like second class citizens. Heck, if I made the commitment to move my family into a 850′ unit in what will generally be an expensive place to live, I’d be happy to deal with the tension of paying affordable condo fees. The comment that the negotiations haven’t been rushed. True enough. Rushed has been the education and time for citizens to digest this radical right turn. This is the first major issue I’ve come out against folks – Cam, Sally, Bill – that I’ve strongly endorsed in the past. The experience has been interesting…. I’ve already tweaked the elevations again in GE using altitude. I believe I’m either going to have to go back to 3DS to fine tune the data or import the same topology that the model was developed against into GoogleEarth (GE). I believe the Planning Department (Gordon Sutherland and company) might have better models of Granville Towers. Mine are envelopes of the actual structure, height based on the testimony of RAM’s designer (who provide comparable elevations for Granville, University Square, NCNB Plaza). Also, I understand that the Mar. 2006 RAM Development Planning documents included a 3DS model of their development. When I get my hands on that, I’ll go ahead and update the Downtown. Please feel free to use the material. If you should get the topology %100 before I do, please send me a copy ( campaign AT willraymond.org ). The Downtown Development Initiative is a steamroller (in more ways then one). Check out this summary of comments from Nov. 20th’s public hearing. A little light and less nuanced than the opposition comments I recall. Good thing there’s a video record on-line. So why introduce the following bias? -Wrong place for this development; put in neighborhoods? -Will units be quiet and have firewall construction? -Will it be family housing? -Is commitment to local businesses being met? -What happens if the developer goes bankrupt? More questions about the Town’s and RAM’s Lot 5 development (DDI) plan? Well, there’s been a dearth of specifics, so there should be a wealth of questions. Add to the throng of “those who want to know” Council member Laurin Easthom. With tonight’s pre-vote presentation on DDI looming (not a public forum)), Easthom weighs in with her questions in what is the most public analysis by one of our elected officials of the “new” RAM development deal. There undoubtedly has been much written and discussed about the redevelopment of Parking Lot Number 5. Here are my feelings. I think that redevelopment of this site for residential and commercial use is important for being an impetus for more good redevelopment downtown in the future. The Town’s stale site (as of 12/04/06) on the Downtown Development Initiative (DDI). 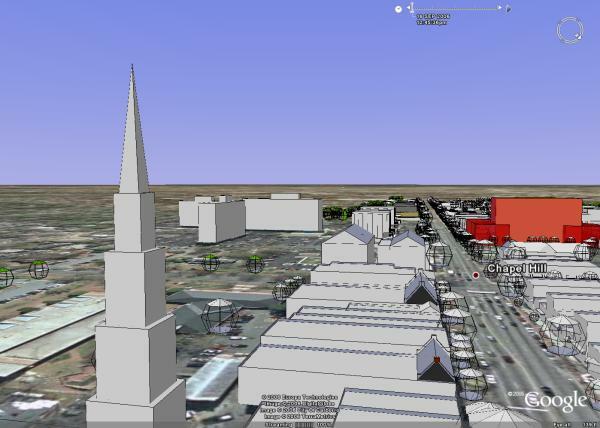 Making some progress on a GoogleEarth visualization of downtown. Here’s some data if you want to either visualize Chapel Hill within GoogleEarth or want to start fresh with a re-import. Small caveat on the GoogleEarth import – don’t turn on the terrain as I still need to tweak the elevations to get the right output. If anyone manages to adjust the terrain before Sunday, please consider routing the changes back my way…. Hope to have Granville Towers and RAM’s Lot 5 proposal by Sunday. And, with any luck, a decent flyby to demonstrate the visual impact of the 104′ leviathan. I believed the Town’s web site covering the Downtown Development Initiative would be updated after Nov. 20th’s public forum. After ten days, I finally sent in a formal request. Thank you for our email message at 10:49 am on Dec. 1 to the Manager, Mayor and Town Council in which you requested that we “publish the remaining reports, discussions notes, comments, etc. that went into forming the “new deal” over the Summer”. To the extent that there are documents related to the negotiations that took place this past summer which are public records under North Carolina law, we will be pleased to make them available for copying. We are in the process of reviewing the staff files to determine what materials are public records and can now be released. However, it will not be possible to complete this work and determine what documents can be provided until next week. Your message also states that “the final deal is set and the public still doesn’t have those details.” As the Agenda materials for the Council’s Dec. 4 meeting indicate, the Council is being asked to consider whether to authorize the completion of a Development Agreement to be brought back for the Council’s consideration in early 2007. Thank you Roger for getting back before close of business. CitizenWill readers, I apologize for not moving more quickly on my request for further information. This Monday (Dec. 4th), Council will take up the composition the Roger Road Area Task Force, I posted on earlier, and the possible future annexation of the eastern side of Rogers Rd. If you’re interested in working with the Rogers Road community to correct these longstanding problems, Monday would be a great time to turn out and let your views be heard. This is still very raw, but I thought I’d put out this demo to stir some thought within the community. 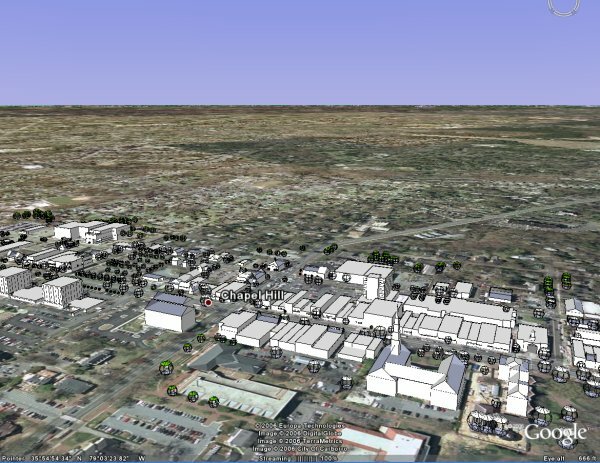 Visualization tools like GoogleEarth (GE) can help remove some of the difficulty in assessing the visual impact of new development. 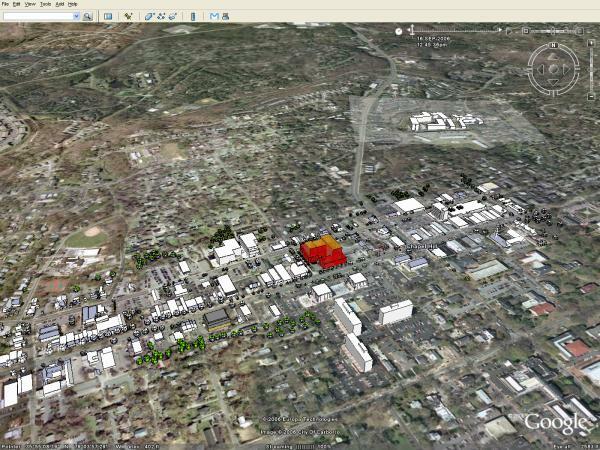 Our town’s planning department has the raw data needed to create a GoogleEarth representation of our town which I plan to massage and then release into the public domain for other citizens to elaborate on. While GE is a proprietary tool, the datasets it uses are exportable. So, Google owns the tool, not the data. Our planning department should be creating GE or NASA Wind World representations of Chapel Hill as a matter of course – it would help both them and the community create a common visual-based framework for development discussions. The Rogers Road community has taken it in the chin for way too long. The promises extended these residents when the landfill expanded into their backyards have never really been fulfilled. Decades old problems with sewage and other infrastructure continue to persist. 11/30/2006 — The public is invited to an open house from 6 to 9 p.m. Thursday, Dec. 7, at the Faith Tabernacle Oasis of Love located at 8005 Rogers Road to discuss planning for the Rogers Road area. In the coming months, the Town of Chapel Hill will launch the discussion to begin the process of drafting the Rogers Road Small Area Plan, which is expected to involve intensive community participation. The plan would provide a vision and guidelines for the future development of the area, including the Greene Tract, and take a detailed look at the impacts of providing public services, especially sewer, and of developing an affordable housing site. The Greene Tract is jointly owned by Chapel Hill, Carrboro and Orange County. 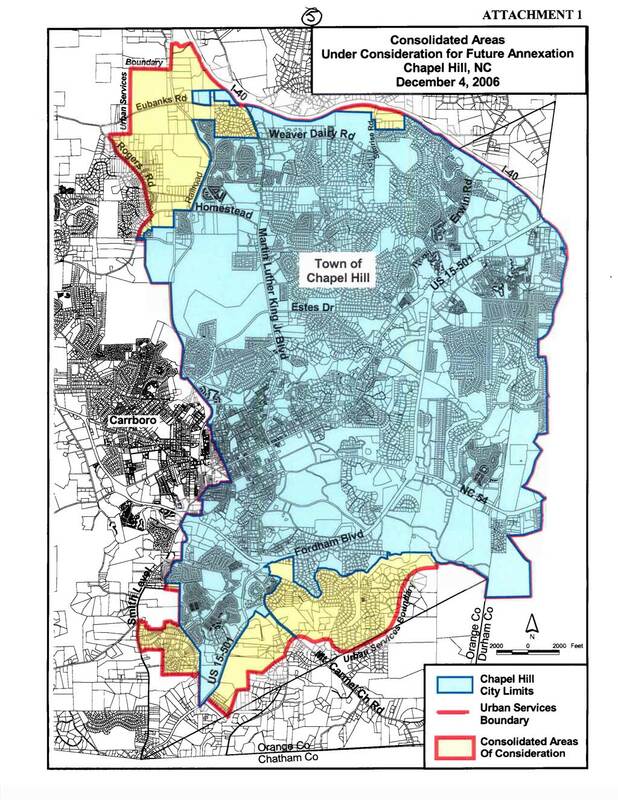 In 2002 the Chapel Hill Town Council adopted a concept plan for the Greene Tract which stipulated that about 18 acres of the 170 acres in the Greene Tract would be set aside for affordable housing and about 86 acres would be set aside for open space. The Chapel Hill Town Council is soliciting residents to serve on the Rogers Road Small Area Plan Task Force. The composition of the task force, to be approved by the Chapel Hill Town Council, will include residents from the Rogers Road area, elected officials from Chapel Hill, Carrboro and Orange County, non-profit housing representatives, and other citizens of the greater community. 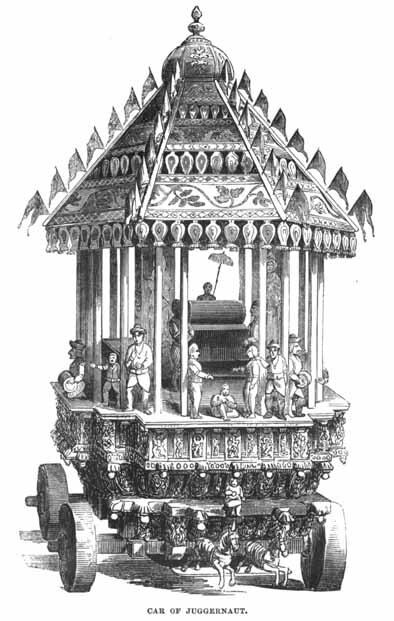 Planners anticipate that the Town Council will appoint members to the task force in January 2007, with the first meeting to be held shortly thereafter. The process to develop the Rogers Road Small Area Plan may take approximately 17 months to two years. Residents interested in serving on the task force are encouraged to call the Chapel Hill Planning Department. Anyone unable to attend the open house may contact the Town of Chapel Hill Planning Department to express their views, to gather more information, or to apply to serve on the task force. Contact Frost Rollins at (919) 968-2728 or e-mail frollins@townofchapelhill.org.